The currency also suffered from a diplomatic spat between the U.S. and Turkey. Building on already tense relations following the suspension of visa services between the two countries in early September, the lira tumbled on accusations made in late November by Turkish authorities regarding a court case on the U.S., which Turkish officials claimed was part of a conspiracy aimed at hurting the domestic economy. The twofold problem quickly soured appetite for lira-denominated assets, causing the currency to weaken substantially and long-term bond yields to shoot up. Renewed political pressure on the CBRT also helped undermine the institution’s credibility and led analysts to question its freedom from political interference, a view substantiated by the Bank’s apparent unwillingness to increase interest rates and instead only tweak at the edges. Among the series of unusual measures implemented throughout November—including the lowering of the upper limit for the FX maintenance facility within the reserve options mechanism and selling short-term forwards to local banks to limit speculative behavior in the FX market—the one that resonated the most was the Bank’s decision to cut banks’ borrowing limits on 21 November, a move that amounted to a 25 basis-point increase to the effective funding rate. Market participants, however, deemed this first tightening of monetary conditions in six months as insufficient. They viewed it as an attempt to buy time ahead of the Bank’s scheduled monetary policy meeting on 14 December. 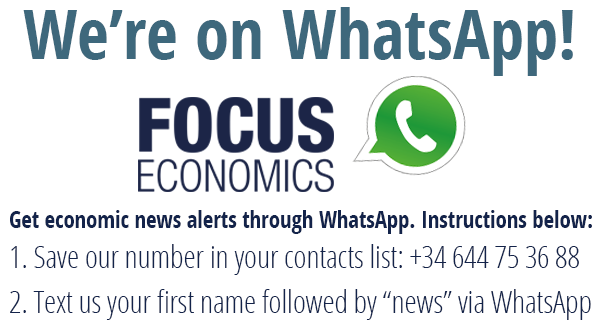 All told, currency-related distress is likely to aggravate existing structural weaknesses in the Turkish economy. The current account deficit reached a two-year high in September, largely due to terms-of-trade losses caused by the rise in oil prices but also to robust domestic demand and a chronic savings gap. The significant deficit has become increasingly difficult to finance given Turkey’s dependency on highly volatile foreign portfolios and declining capital inflows, which has resulted in a steady decrease in FX reserves since the outset of 2017. 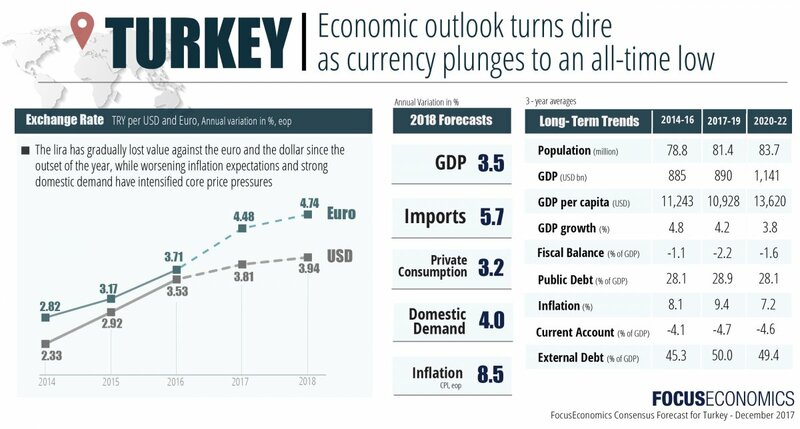 Looking ahead, worsening external metrics, deteriorating Turkey-U.S. relations and Erdogan’s unorthodox stance on monetary policy are likely to keep dragging on the lira’s performance. This will negatively feed into inflation expectations as well as make Turkey’s vulnerability to shifts in market sentiment more acute, particularly amid tightening global liquidity. Our panel expects the TRY to end 2018 at 3.91 per USD, and it projects the lira to depreciate further to 3.98 per USD by the end of 2019.